The events will feature information about Watson’s undergraduate degree and licensure programs, a student panel discussion and a tour of our beautiful education building! Refreshments will be served and parking is free in the parking deck. Register for one of our Watson College Preview Events here. Get Involved. Become a Teacher. Change Lives. 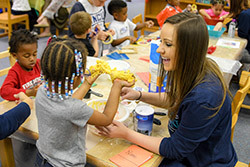 Undergraduate degree and licensure programs at UNCW’s Watson College of Education provide a pathway to earn the credentials needed to teach students in grades pre-K through high school. Each program offers field experiences in local classrooms, the Education Lab, the community and abroad. These experiences give future teachers the opportunity to apply theory to practice in a wide range of real-world settings, and build skills and confidence needed to succeed in the classroom.